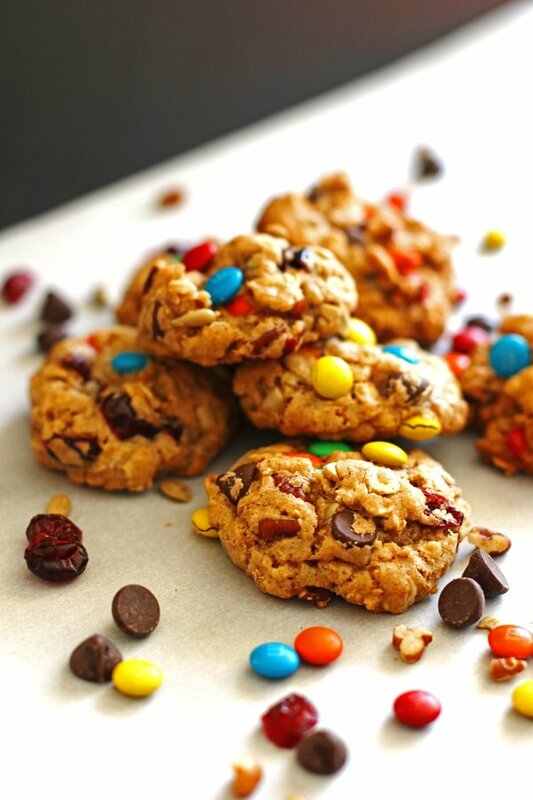 These Trail Mix Cookies are a great little treat for you and your family. Filled with ingredients that you normally put it trail mix like sunflower seeds, dried cranberries, pecans and of course, some chocolate! To me, it is not a good trail mix without some chocolate. I happen to be a chocolate lover! So I added in some chocolate chips and mini M&M’s. This recipe originates from one of my new cookbooks I recently got for Christmas, The Perfect Cookie: Your Ultimate Guide to Foolproof Cookies, Brownies & Bars cookbook. The book is filled with amazing cookie recipes and has baking tips in there as well. This is the first recipe I tried from the cookbook. 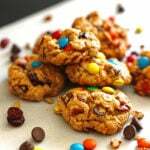 I liked this recipe because it is a great cookie that is a bit healthier and has a great taste to it. We use brown sugar in this recipe. When measuring your brown sugar, make sure you pack it in to your measuring cup so you get the right measurement. I usually scoop it into my measuring cup with a smaller measuring cup and then press down with the bottom of the smaller cup to pack it in there well. Light or dark brown sugar will be fine for this cookie recipe. To keep your brown sugar soft, keep one of these Brown Sugar Bears in your airtight container. Now, to make these delicious cookies, whisk together the oats, the flours, salt, cinnamon and baking soda in a bowl and set that aside. Then whisk the melted butter, egg and vanilla in a large bowl. Add in the sugar and mix until it is smooth, scraping the sides of the bowl to make sure you have all the sugar mixed in well. Stir in the oat mixture and mix just until all the ingredients are combined. Then add in the trail mix goodies and stir just until they are mixed in well. I use a OXO Good Grips Medium Cookie Scoop to get a heaping tablespoon of dough to make each cookie. Then roll the dough in your hands to make a ball and place on the covered baking sheet. I use Artisan Silicone Baking Mats (parchment paper also works well) to cover your baking sheets. 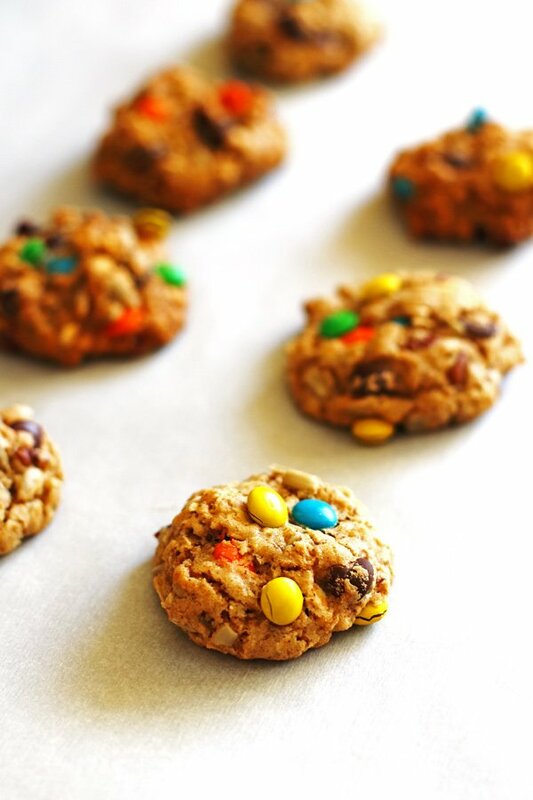 If you want, you can add a few chocolate chips or mini M&M’s to the top of the cookie balls to make them look a little prettier. Place them about 2” apart on your baking sheet. Bake one sheet at a time in your oven preheated at 350 degrees. Bake them for 12-14 minutes until the edges are slightly brown, rotating the baking sheet halfway through. When the cookies are done, the middle of the cookies might look a little soft and undone but that is okay. Once the cookies are done, leave them on the cookie sheets for ten minutes to cool. And that is it! You can have them warm or cool them completely and store them in an airtight container. Have you ever baked your cookies just a little too long? And your cookies are a bit overdone and hard? You know…the kind you have to eat with a glass of milk because they need to be dunked in the milk? I know I have! I have a great trick for you…I learned it from my neighbor Dorothy when I was a kid. And I still use it because it really is such a great trick. Place you cookies in an airtight container and add a slice of bread in there. Give it a few hours and check the cookies to see if they have softened up. If not, give it a little longer. The bread will become harder and the cookies softer. It is like magic! I love this trick. Looking for a great trail mix recipe? 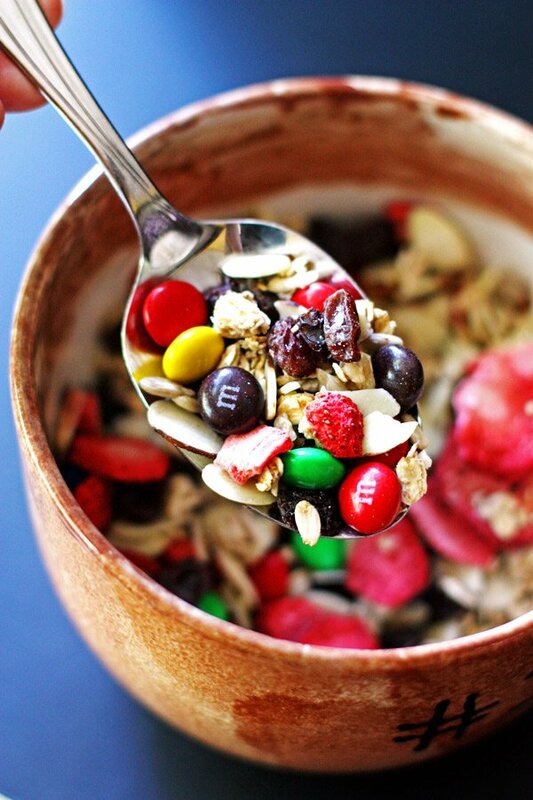 Check out my Trail Mix recipe…so easy and such a great snack. It is great to have while out for a hike and also a great after school snack. Happy trails and happy baking! 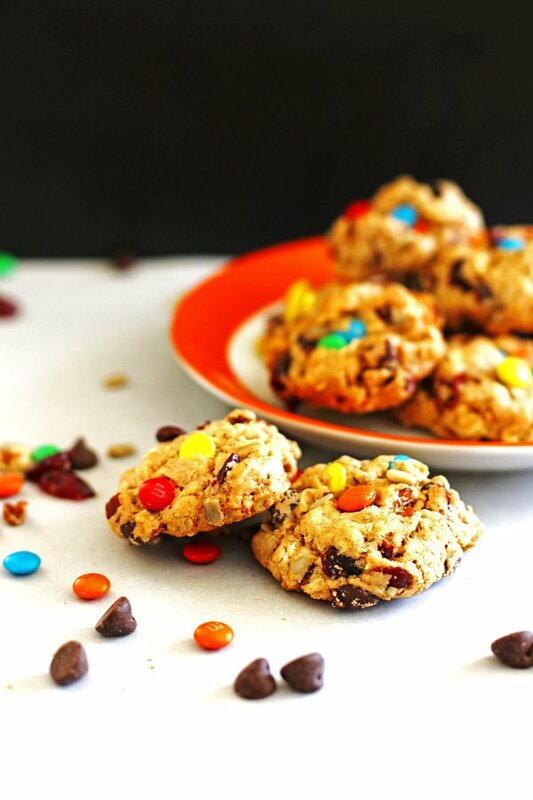 A delicious cookie that is sure to please and is also on the healthier side! Preheat your oven to 350 degrees. Adjust your oven rack to the middle of your oven. Cover your baking sheets with silicone mats or parchment paper and set aside. In a bowl, whisk together the oats, whole wheat and all-purpose flours, salt, cinnamon and baking soda. Set aside. In a large bowl, whisk the melted butter, egg, vanilla and sugar until combined. Add in the sugar and stir until mixture is smooth. Scrape the sides of the bowl to make sure you have all the sugar mixed in. Stir in the oat mixture until just combined. Add in the cranberries, sunflower seeds, pecans, chocolate chips and M&M’s and stir just until they are all mixed in well. Make your cookie dough balls a heaping tablespoon in size. Roll them into balls and place them on the covered baking sheet two inches apart. Bake one sheet at a time, rotating it half way through, for 12-14 minutes. Cookies are done when the edges are slightly brown. Remove from oven and let them cool on the cookie sheet for ten minutes. These cookies look so delicious and perfect for kids!